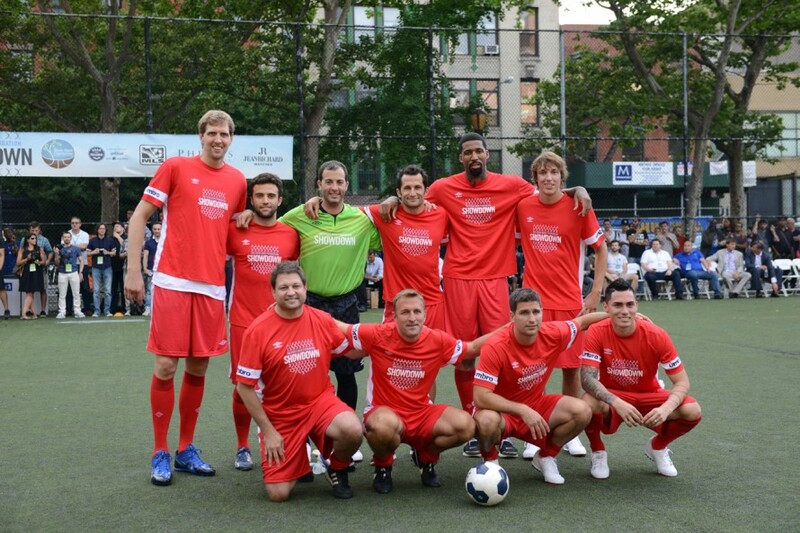 Our seventh Steve Nash Foundation Showdown in New York City’s Sara D. Roosevelt Park (our 9th Showdown overall) kicked off on Wednesday, June 25, 2014 to a capacity crowd gathered on the Lower East Side — thousands toured through Showdown’s FanFest, meeting with our great sponsors: Umbro, Cyber Dust, MLS, jetBlue’s Soar With Reading, JAWBONE, JEANRICHARD, and Microsoft Windows 8, while keeping hydrated with BODYARMOR, and EBOOST, and staying healthy with sunscreen and more from the Honest Company. After Steve enjoyed some one-on-one time with our sponsors (and we finally met jetBlue CMO Marty St. George! ), and Dirk and Hasan reunited for German TV, the players made the walk from our hotel to the pitch a community affair, with kids and neighbors of all ages stopping them for photos, autographs, and old-school high-fives. After meeting with fans and the media on the pitch, the pre-game festivities began: our repeat (re: fantastic) on-field MC Spero Dedes brought US Representative of JEANRICHARD Watches Paul Erhard to centerpitch to present the Spirit of Showdown award to perennial fan/player/everyone favorite (and wonderful supporter) Giuseppe Rossi. Giuseppe was honored with a unique JEANRICHARD Aluminum Terrascope, a lovely keepsake for a lovely friend of the Foundation. 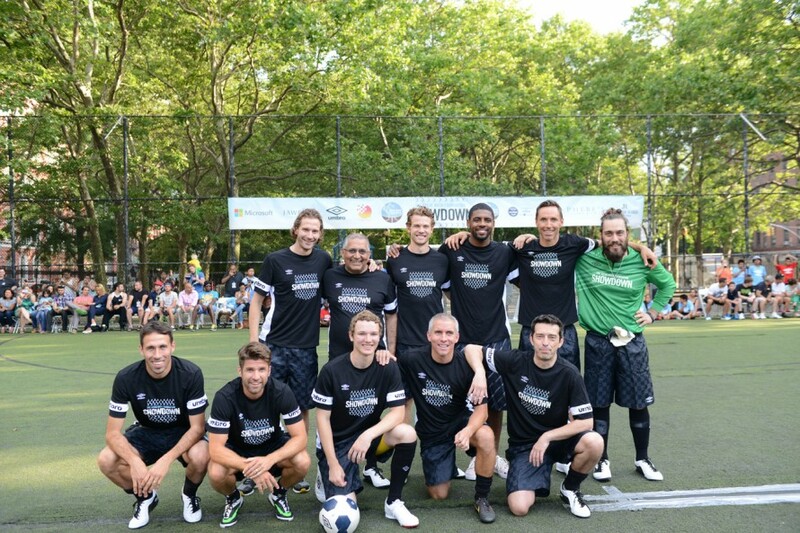 Spero next called to the field Iconix Brand Group and Umbro CEO Seth Horowitz, who presented the game ball in style to Steve, and kicked things off — we can’t thank Umbro enough for stepping up to outfit Showdown, and for doing it with such spirit and enthusiasm. Then the game got underway! Dirk started off with some big effort, but Phebe’s alum Kyle Martino put in our first goal (and then scaled the fences ala Jared Dudley circa 2009). Goals followed by Marc Stein, Jason Kreis, Stephen himself, Giuseppe, Simone, Richie (one of our two hat-trickers), Tomas (the other! ), Kyle again, Mason and our rookie Bobby Perez — who thrilled Steve with his play, courage, and passion (quick – and unbelievable – backstory: our first-ever Prizeo contest, with a grand prize of two roundtrip tickets to New York, a two-night hotel stay at our player hotel, and 5-minutes of play in Showdown with VIP access to all-things-Showdown, went world-wide — our winner was a wonderful middle-school guidance counselor who generously gifted her prize to her nephew, Bobby, a big fan of Steve’s . . . but it wasn’t their first time meeting. Coincidentally, Bobby had met Steve in Los Angeles through mutual friend Hubie Brown, the night Steve broke Mark Jackson’s All-Time Assists record. When he turned out to be our Prizeo Pick, both he and Steve were thrilled by the opportunity to reconnect, and we loved having the whole Perez/Hinton gang with us). By the time the (light!) rain started and the final whistle blew, Team Black had bested Team Red by a score of 11-7, returning Team Nash to Showdown glory once again! NBA MVP Dirk Nowitzki was a clear choice for the JEANRICHARD Player of the Match Award, and was presented a Aluminum Terrascope for his solid effort, stellar sportsmanship, and, yes, his moves. We don’t take for granted the amazing welcome we receive every year from the community on the Lower East Side, and this year we are proud to have worked with the Iconix Group to donate new Umbro duffel bags to local children receiving transitional care through the iconic Henry Street Settlement. When kids don’t have permanent homes, they often find themselves moving with their belongings in garbage bags – a demeaning position for children already facing enormous challenges. This small change can lend an added sense of security to foster and homeless children, and we appreciate Umbro’s commitment to using their extraordinary products for community welfare. Showdown would not have been possible without the hard work of our good friends at the Promotion Factory, and Bigger Goals, the countless volunteers that return year after year to bring Showdown to the masses, our dedicated sponsors, players, and, of course, the fans that keep demand for their favorite game of footie strong. Check back for photos soon, get your Showdown gear here, and we’ll see you next year!